Here’s a great Thanksgiving recipe from Todd Adelman, Director of Nutritional Services for Block Institute, and co-author of ‘Special Foods for Special Kids: Practical Solutions & Great Recipes for Children with Food Allergies’. Slice potatoes in half, lengthwise. Cut small slit in center of potato. Bake for 45 minutes or until tender when pierced with knife. Scoop out pulp of sweet potatoes being careful to leave the skin intact. Add salt to pulp & set aside. Cut apples into thin slices. Toss apples in orange juice & add cinnamon. Sauté apple mixture in margarine over medium heat, stirring constantly until apples are soft & liquid is absorbed. Add apple mixture to sweet potato pulp & process (or mash) until smooth. Fill potato shells to rim. Bake on foil lined cookie sheets at 400 degrees Fahrenheit for 30 minutes. 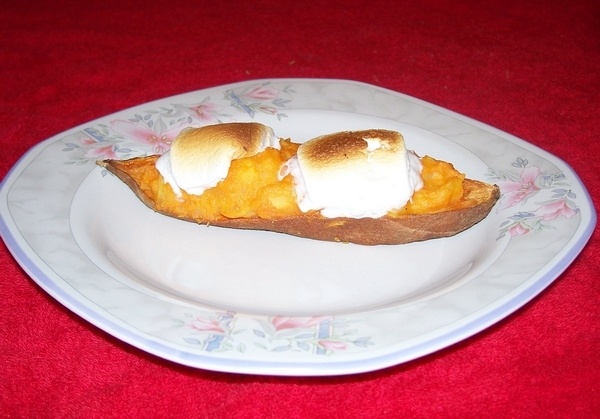 Top each potato half with 2 pieces of marshmallow. Milk allergy: Use milk-free margarine. Gluten allergy: No substitute needed. Egg allergy: Substitute 1 ½ tsp. egg replacer mixed with 2 Tbsp. of water for egg. Use egg-free marshmallows. That looks fantabulous! I was looking for something different to go with steaks tomorrow night – I’m totally trying this!!! It really looks delicious. YUMMY. I am definitely gonna try this one in my kitchen. Thanks for sharing.